TORONTO, May 30 2012 (IPS) - Potential storms are on the horizon for much praised, regulated and privately-owned Canadian banks which survived the 2008 financial meltdown unscathed, unlike some of their larger counterparts in the United States. 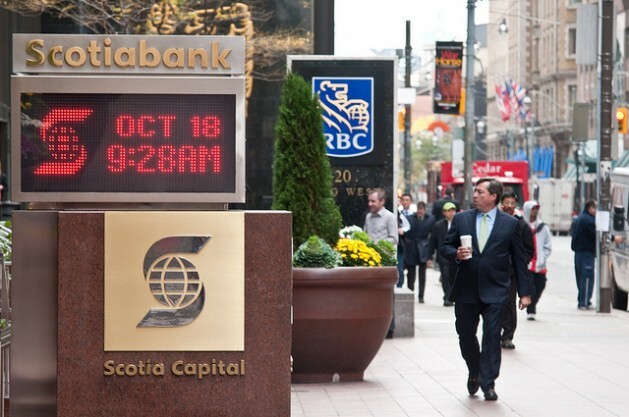 During the crisis, Canada was given the thumbs up for having the soundest banking system in a survey of corporate executives by the World Economic Forum. Nevertheless, the interrelated nature of the international banking system makes Canadian banks, valued at 6.3 trillion dollars in total, still vulnerable, says David MacDonald, a senior economist at the Canadian Centre for Policy Alternatives in Ottawa. “The Canadian banks aren’t exposed directly to the European sovereign debt crisis. (But) the effect that they would feel would be (serious) if other banks they did business with suddenly went under or if confidence in the wholesale banking markets suffered, then it would be harder for Canadian banks to get liquidity,” MacDonald told IPS. Here, Canada’s central bank, the Bank of Canada, along with other federal government agencies would assuredly intervene with a second “backstop/bailout” programme, he said. Some controversy developed when MacDonald applied the word “bailout” in his recent report to show how the Canadian government between 2008 and 2010 relieved domestic banks of more than 100 billion dollars in unmarketable mortgage securities to maintain liquidity. That three of Canada’s major banks – CIBC, BMO and Scotiabank – received financial support greater than they were worth at the time “is concerning frankly”, MacDonald told IPS. His comments countered the accepted wisdom in Ottawa and the financial community that more profligate and shaky U.S. banks were “bailed out” by Washington for investing in overvalued securities containing subprime mortgages, while the better managed Canadian banks were rewarded with a mere “backstop” from their own government. “There is a concern that you are creating a story that doesn’t exist,” one interviewer, Anna Maria Tremonti, pointedly asked MacDonald on a national CBC radio morning news programme, The Current. University of Toronto finance professor Laurence Booth described the Canadian bank bailout story from MacDonald as pure “conspiracy” thinking. In an interview with IPS, Booth defended the assistance provided by the Bank of Canada and Canada Mortgage and Housing Corporation, as well as the U.S. Federal Reserve, which also provided bailouts to non-U.S. financial institutions operating in the United States during the 2008 financial crisis. “The banks have the right to borrow under the standing liquidity facility and/or the emergency liquidity facility from the Bank of Canada. This provides purchase and resale agreement (PRA) financing with securities determined as eligible by the Bank of Canada,” Booth said. Nevertheless, Canadian investors also got burned buying securities containing toxic U.S. mortgages from Canadian financial institutions. Canadians are living with legacy of national governments in North America and Europe that allowed banks to purchase brokerage houses and engage in high-risk gambling on the stock market, says Jim Stanford, an economist with the Canadian Auto Workers trade union. In Canada, for instance, the rules were loosened to allow this in the early 1990s, he noted. Domestic banks which primarily lent credit to customers in return for interest suddenly went wild with aggressive selling to investors and the rewarding of inflated compensation payments in the millions to their CEOs, Stanford told IPS. “You also just had a shift where the money made on those speculative casinos was so enormous. That is where banks put their smartest and bright people and more and more of their attention,” he said. Toronto’s Bay Street represents the epicentre of the Canadian finance industry. The author, award-winning investigative journalist Bruce Livesey, describes in detail the scamming of large sums of money, often retirement savings from vulnerable older Canadians, through the unscrupulous selling of stock in overvalued shady enterprises that eventually go bust and leave the unsophisticated investors out of pocket. He says that fewer than 20 Canadians have gone to jail for securities fraud even though in 2010 alone nearly 15 billion dollars worth of losses stemming from securities fraud were pursued in lawsuits in Canada. “The legal, political, financial and business establishment in places like Toronto all work together in the same tightly knit circles. They live in the same neighbourhoods. They do not want to regulate each other. They don’t want to put their friends in jail,” Livesey told IPS. “Most (provincial Canadian) securities commissions don’t have a serious investigation branch. They have dual roles, which is to facilitate investment in Canada and secondly to protect investors,” according L.S. (Al) Rosen, a Toronto-based forensic accountant, academic and author of “Swindlers: Cons and Cheats and How to Protect Your Investments From Them”. Unknown is the extent of Canadian bank exposure to risky investment instruments, particularly derivatives, Rosen told IPS. “Canadian banks are exposed, but by how much is hard to say,” he said. “Canadian laws allow banks to hide information. “The point is if you are the average crook, and look at where you can work a scam, then Canada is perfect because it is an easy prey,” Rosen adds. Economist Jim Stanford, who writes a regular newspaper column and is an author of a book on the stock market, worries more about Canadian banks over lending in so-called hot commodities and causing damage to the “real economy”, where the majority of the population participates and is employed. “I think we absolutely will have another (world) financial crisis. The question is where and when and what the particular sparks will be. It could be speculation in Apple shares, it could be rare earth shares. It could be an oil meltdown (if the oil price falls significantly from the present level),” he said. “The dynamics of the crisis is that you start with something that moves positively, the speculators jump on board, they pump it more than it is worth and eventually it busts,” added Stanford. But the “conservative” nature of Canadian bankers will ultimately discourage that kind of risky investment behaviour witnessed in financial sectors elsewhere, counters Professor Laurence Booth. He cites, for instance the “primitive development of credit default swaps in Canada”. Canada’s five largest banks in 2011 generated about 22.4 billion dollars, up 15 percent from the previous year, and employ about 300,000 workers at home and abroad.